SYCL (sɪkəl – as in sickle) is a royalty-free, cross-platform Khronos specification facilitating a C++ abstraction layer that builds on the underlying concepts, portability and efficiency of OpenCL, while adding the ease-of-use and flexibility of C++. SYCL enables single source development where C++ template functions can contain both host and device code to construct complex algorithms that use OpenCL acceleration, and then re-use them throughout their source code on different types of data. 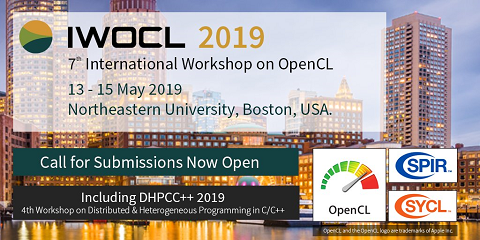 The SYCL Workshop aims to gather together SYCL’s users, researchers, educators and implementors to encourage and grow a community of users behind the SYCL standard, and related work in C++ for heterogeneous architectures. SYCL 2017 is a half-day workshop to be held in Austin, Texas, on the 4th or 5th of February 2017, in conjunction with ACM PPoPP 2017. All submissions must be made electronically through the conference submission site, at LINK. Submissions must be in PDF format and printable on US Letter size paper. All submissions will be peer-reviewed by at least two members of the program committee. We will aim to give longer presentation slots to papers than to extended abstracts. Conference papers will not be published, but made available through the website, alongside the slides used for each presentation. The aim is to enable authors to get feedback and ideas that can later go into other publications. We will encourage questions and discussions during the workshop, to create an open environment for the community to engage with.